Sanghursh Sports Academy is a memorial trust in the name of late Sanghursh Chauhan son of Mrs.Sarita Chauhan and Mr.Govind Singh Chauhan. 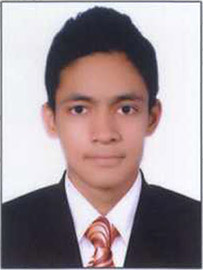 Sanghursh passed away in a cruel road accident on 9th December ‘2012 at the age of 18 years and 7 months. Sanghursh was being himself a sports person had always a dream to set up an academy where multi dimensional qualities and skills of the sports stras can be nurtured, developed and sharpened. His parents, friends, relatives and well wishers have decided to make best of efforts to make his dream true to promote games and sports under this banner. Sanghursh Chauhan studied in Somerville School, Vasundhara Enclave, and Delhi since beginning of his primary school and passed out his 12th exams in 2012. He has been a star player of the school and Captain of the school football team. He had played in DDA’s Junior Football Team for 3 years. Snookers, dancing and stage play were his hobbies apart from his love with Football. Copyright © Sanghursh Sports Academy All rights reserved.